Maggie Mae...The Best Dog Ever! Maggie Mae engulfed our home with love and happiness when she was just 6 weeks old. We brought her into our family, taught her the rules of the house and loved her with all our hearts just as she loved us. Maggie even loved the birds and cats that joined our family as well. Always such an easygoing faithful companion. We couldn't ask for a better dog! But don't leave your Easter basket out because she would surely steal your candy while you were away! It's only been 24 hours since I had to make the hardest decision of my life. 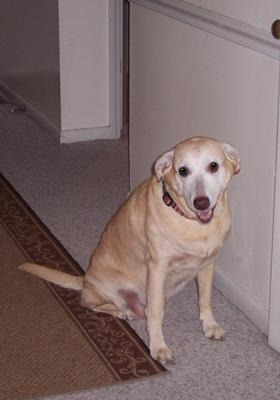 I had to put my own selfish needs away and do what was best for my yellow lab Maggie, who was like my third daughter. She was an important part of our family for the last 12 years... and we loved her so. 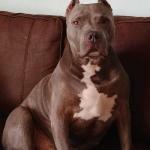 Maggie developed a cancerous tumor on the outside of her chest. It had taken over my poor Maggie's body... made her tired and weak. Cancer had ravished her lungs to where she couldn't breathe without wheezing. It only took 2 minutes for her pain to end, as I held her head in my hands with her big brown eyes still looking at me as my tears fell onto her. It was so hard to believe that my Maggie was gone. She seemed at peace now as I kissed her head and said good-bye. There will never be another dog like my Maggie. We love you Maggie and miss you so much. One day we will be with you again. Comments for Maggie Mae...The Best Dog Ever! This summer we found an underfed little puppy at a rescue centre in Greece. She has big brown eyes and huge floppy ears. Our sons loved her instantly and we took her home. We couldn't leave her behind. The vet told us she was much older than we thought. It took a few weeks of good food. She was getting good food and finally could start growing. She is so kind and sweet. From the first day, she was part of our family. She is like your dog and wears the same name. We hope to have her as long as you did. We thought it would be a nice to hear that somewhere in the world there is another Maggie Mae and she is loved as much as you loved your dog. Our yellow lab Holly was the best dog we have ever owned. It's been 15 years since we also had to make the same decision you just made. Since that time we have had 3 miniature schnauzers......and we have also had to put 2 them down. I swore to myself after Holly that I would never do it again......but you soon realize that it was and is the right thing to do. We now have 2 cats and I really miss my dogs... especially Holly. Tomorrow on Christmas Day, I will be writing a check to put down on the first pick of yellow labs here in PA. They are not due to be born until March 2009. They should be ready to take home in late April or May. We are picking out names for her and so far we are leaning towards either Maggie or Molly. Tough decision. Anyway, that's how we came across your story. I hope that in the near future you'll consider getting another lab. None will ever take the place of your Maggie and that's the way it should be. But you deserve the joy that they bring into your heart. So, don't wait too long. God Bless. Maggie's in good hands.